....in the old blog yet. After many years of neglect I am starting to work up my life drawing chops as part of an MA that I'm studying. I had forgotten just how challenging drawing the human figure was... and to prove it here are the first few weeks efforts. In fairness - I'm also trying to make things a bit more challenging by concentrating on hard line work (as opposed to the smudgy graphite form building with tone that I'm used to)... so I'm purposely putting myself outside established comfort zones. But thats how you learn, no? Poses vary from 90 minutes or so - down to 20. 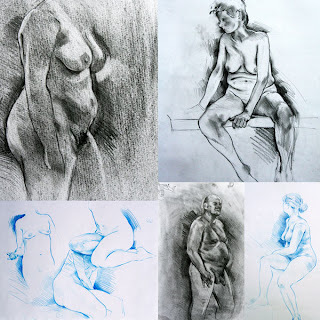 Very nice life drawings. Glad to see some new stuff on your blog, hopefully some more posts in the near future.